ATM fraud is a growing global problem, and U.S. banks are gearing up to fight malware and hackers. Boston, November 23, 2016 – ATM fraud is growing, and massive attacks are being orchestrated around the globe using malware and coordinated cyber schemes. In the U.S., the newest forms of fraud have not yet struck, but challenges for protecting ATMs continue to abound. 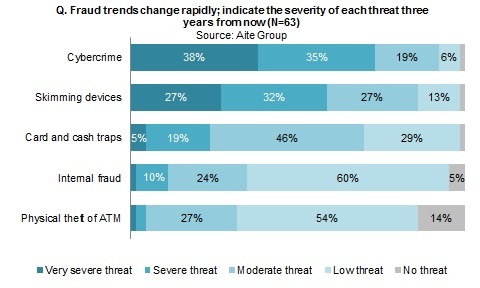 What can the largest U.S. banks do to protect against new ATM fraud threats that will eventually arrive on U.S. shores? This Impact Note explores the current fraud environment in the United States as well as some of the threats financial institutions must prepare for. It is based on a Q4 2016 Aite Group survey of 63 executives at U.S. financial institutions. This 24-page Impact Note contains 16 figures and three tables. Clients of Aite Group’s Retail Banking & Payments service can download this report, the corresponding charts, and the Executive Impact Deck. This report mentions Diebold, FICO, NCR, and Tyco Integrated Security.